Online courses allow flexibility for travel and competitions during the school year, letting student-athletes pursue their dreams. Lana Mavor is heading to Florida next week to train at the prestigious IMG Academy, then to compete in a national tennis tournament. Kaci-Lee Ver Sluis recently went to Maryland and South Carolina for training sessions and then to compete in the Beltsville Open in Maryland, a highly competitive judo tournament. Even with school back in session, neither girl is missing classes or falling behind in her studies. Mavor, a 16-year-old high school junior from Yarmouth, and Ver Sluis, a 12-year-old seventh-grader from Sabattus, are enrolled in the Maine Virtual Academy, a public charter school based in Augusta that instructs students through online classes. Education through virtual schools provides high-level young athletes such as these the flexibility to travel to out-of-state competitions while maintaining their classwork. In some cases, however, virtual schools have come under criticism for falling short of the education provided by traditional schools. 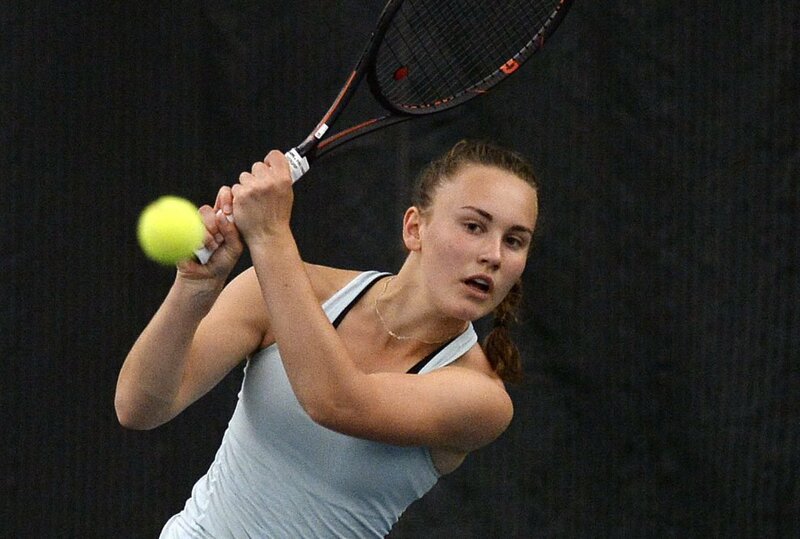 Mavor, who won the Maine Principals’ Association girls’ singles championship last spring while representing Yarmouth High, is among New England’s – and the nation’s – top tennis players in her age group. Ver Sluis is a member of the U.S. Junior judo team and has competed internationally. Maine Virtual Academy – or MEVA – is one of two virtual schools in Maine, the other being the Maine Connections Academy in South Portland, which was the first virtual school approved by the Maine Charter School Commission in 2014. Both are tuition-free, online public schools. There are public virtual schools in 34 states nationwide. MEVA is entering its third year and has 390 students in grades 7-12. Computers and printers are provided to families if requested. Students generally take five to seven courses per semester, and are required to participate in individual or group activities during the class. Both Mavor and Ver Sluis attended public schools until their competition schedules became loaded. Ver Sluis took summer courses this year and is starting her first full academic year with MEVA. Her courses include math, reading, science, social studies and art. Now, if Ver Sluis is competing in the Bahamas (where she was recently the only member of the U.S. team to bring home two medals) or the Dominican Republic or Florida, she can keep up with her classes, even if she misses one. Dr. Melinda Browne, the head of school at MEVA, said athletes like Mavor and Ver Sluis can benefit greatly from an online education. Browne estimates that 25 percent of MEVA’s students are athletes. “Obviously, Lana and Kaci-Lee are something special and very serious about their sports,” she said. “One of the features of our model that is appealing to students like them is that, if they are unable to attend their lesson in real time – and that’s kind of rare, they generally do – but if they’re on a plane or traveling, they let the school know they will not be in the live class. And then they are able to watch the recorded session and complete the assessment of the lesson and any required assignments. Mavor, who is ranked No. 1 in New England and No. 48 nationally in the girls’ 16-and-under age category, has been a student with MEVA since it opened. Mavor said her virtual education is not lacking. Virtual schools nationwide have often received critical reviews from the National Education Policy Center over the years, citing poor test scores, a lower graduation rate than traditional schools and a lack of interaction between teachers and students. Two years ago, the NCAA announced that it would not accept coursework from many virtual schools operated by K12 Inc. – the same learning platform used by MEVA – at any Division I or Division II school. Browne said MEVA has been working with the NCAA since last spring to gain approval for its courses. Gary Miron, a professor at Western Michigan University, has authored several reports on virtual schools for the National Education Policy Center. He believes that virtual schools need much improving and should put more money into their teachers and educational services, but he also thinks they serve motivated students like Mavor and Van Sluis very well. “Those are the questions that will have to be sorted out in terms of what makes an athlete NCAA-eligible and what doesn’t,” he said. Likewise, Ver Sluis has big ambitions for judo. Neither Mavor nor Van Sluis misses the social aspect of school. When they are home, they still hang out with their friends. In fact, said Ver Sluis, some of her friends often join her in her garage for workouts on the judo dummies she has there. UPDATE: This story was updated at 1:15 p.m. on Sept. 19 to correct the New England and national rankings of tennis player Lana Mavor.